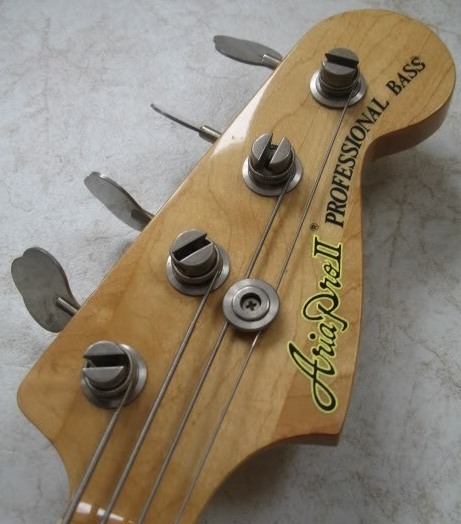 This is a really neat Japanese lawsuit P Bass copy – a 1976 Aria Pro II Professional Bass. If you can find one of these (or its brothers) you will be getting a great bass for short money. 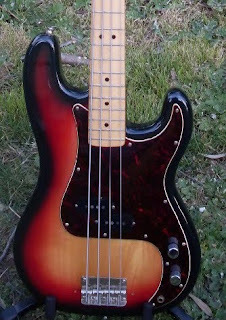 This series of Aria P Bass copies was made from 1976 to 1981. All of these Matsumoku-built basses were made to the same specification, with different Fender-Styled logos on the headstock. In 1976 they called it the Professional Bass, in 1977 it was the Precise Bass and from 1978 to 1981 it was named the Primary Bass. In 1982 Fender said “enough”, and we did not see these great copies anymore. 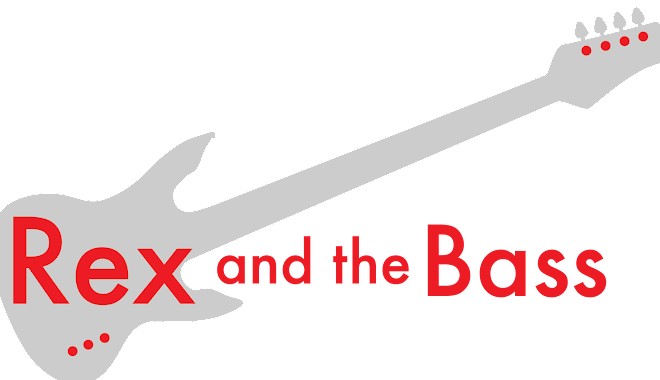 If you do not look at the headstock logo, this bass is visually no different than a 1970s-vintage Fender Precision Bass. The body, pickguard and headstock shapes are all the same. The body is made of ash (I think) with a tasteful 3-tone sunburst lacquer finish. I have also seen these basses in black and natural finishes. The multi-layer tortoise pickguard is closer in color to what Fender actually made, when compared to other Japanese copies I have seen. This leads me to believe that maybe it was replaced at some point in time. The neck is the fattest one I have ever seen this side of a 51-reissue Precision Bass. It has the same 1 5/8-inch nut width, but the overall profile of the neck is a really fat D shape. I mean, really a D – there is a very flat radius on the fretboard. The 20 original frets are in good shape and appear to be almost jumbo wire. The truss rod adjustment is an hex head at the heel of the neck, which is not terribly convenient, but it is what it is. The tuners are good copies of the open-gear Fender parts, and look lust right on this bass. The tuners are tight, and hold tune well. The electronics are not complicated, but then again, it is a P Bass. There is a split-coil pickup, which Aria says is a SB-II. Ok. The controls are the usual volume and tone knobs. But, this set-up has a tone of output compared to every other passive P Bass I have played. This is a super-hot pickup and I had to vary my usual “everything dimed” P Bass set-up and back off the tone knob a little to get a more mellow tone. A nice style element on these Aria P Basses is they all came with a good-looking chrome bridge cover, but no pickup cover. It makes them just a little different than the Fenders of the era. I found this one at a secondhand store in Japan for about $150, and I see them on eBay nowadays for $300 to $400. They are a great bass for the money if you are looking for a P Bass with vintage vibe. That looks nicer than the ones I remember seeing around the bay area back when. Is it very bright compared to the usual, or high-output as well? i had an old aria pro 2 that was stolen :( was red woodgrain with black pickguard, neck thru - goldy plastic knobs and an active/passive switch and KEF pickup - i cant find any arias with KEF pickups - maybe it was a prototype? really want it back or find another the same - long scale neck ... i remember it saying aria research and development on the head... im sure my old band members would have a pic somewhere... will have to hunt for them... any ideas on the model? @ Corey: aye, loud and bright, it is. @ Anonymous: I woul love to see a picture to see what model it is. Why do Things Cost so Much at Pawn Shops?